FREE ECOURSE BONUS | GOD Who Are You? AND Who Am I? to spiritual, mental, emotional, financial and physical healing so you can feel loved by God, live with peace and joy, and be ready to come face-to-face with Him . . .
How Strong is Your Spiritual Internet Connection? Early one morning the Lord showed me exactly how our relationship with Him is like a strong, weak or nonexistent internet connection. And, that relationship with Him is the reason for this FREE eCourse Bonus to the book GOD Who Are You? AND Who AM I? Knowing and Experiencing God by His Hebrew Names. Allow me to explain what this eCourse is all about. When we moved into our neighborhood near the lake, the city was introducing underground fiber-optic, cable internet, TV and phone service called BOLT. Every business and individual around the lake was having trouble with wireless being reliable, especially in storms. BOLT is still digging millions of miles to connect every household who chooses them. They are so highly regarded that people post one word on Facebook – BOLT – and everyone knows the cable finally reached their house. Fiber-optic equipment keeps getting better, so equipping existing fiber with new electronics and with lasers that pulse light faster increases bandwidth without changing the fiber itself. This gives it a “future proof” existence, since the need for higher bandwidth increases every year––much like our relationship with God. He is our only “future proof” existence of light, and our need for Him increases every year. It was dark, so I went to find my oil lamp that I sometimes enjoy lighting for special worship times. Watching the flame of it or a candle always makes me feel closer to God in the early morning hours. I picked up one from the cabinet that was empty. Finally, I found the one I had used before, partially filled . . . and partially empty. 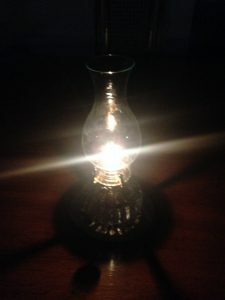 The words to the old song rang through my mind: Give me oil in my lamp, keep it burning. Give me oil in my lamp, I pray; give me oil in my lamp, keep it burning, burning, burning; keep it burning ‘til the break of day. My thoughts went to the fact that if my body is the lamp and I haven’t filled it with oil, it will be like the first lamp I picked up. In the Bible, the symbol for Holy Spirit is oil. The second lamp is the Christian who has very little oil in her lamp. It will soon be just like the first, unless she finds the source of oil, refills it and keeps it filled. The source is Jesus Christ – the “baptizer in the Holy Spirit and fire”––that lights her up and makes her not sensitive to lightening strikes in storms. Bottom line: without a strong, underground, daily connected relationship with Jesus Christ, we will wear out quickly and be absolutely burned out, because our need for His light, fire and flame is ever increasing. 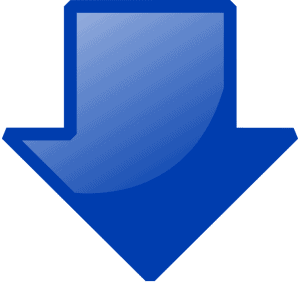 Have you ever uploaded a file from your computer over the internet? I recently needed one book cover transformed into four different ebook covers for this on-line course. After I received them back, I learned a young lady in India had done it for me – on the other side of the planet! My computer was turned on. I had a strong, grounded fiber-optic, cable internet connection. The Web site I tried to reach was also a strong connection whose server was never down. Am I turned on? is the question. Have I tried to make a connection with Him lately? If He can’t see my IP address, or the connection from where He is, He can do nothing else on that day except to say, “I never knew you.” He would not be ABLE to pull you up – or upload you – to His site when He comes back for His Bride , the Church worldwide. This free ecourse bonus to the book GOD Who Are You? will show you the way, so Jesus never has to say that of you. Does Jesus Know Your Address? Have you uploaded a selfie to HIM? Does He see it daily so He will recognize you and be able to transform you? The five-foolish tried to get oil from someone else. That’s like expecting to upload your selfie picture, that only you possess, on someone else’s phone. Can’t be done! Is your lamp empty or full? It takes effort to fill it. It takes a surrender of your heart and life to the LORD! The five-foolish, too busy, too lazy, unprepared [wo]men woke up too late––with only a dead religion to show for their lives. As a result, they had no personal relationship with the groom they were to marry, and were left behind. 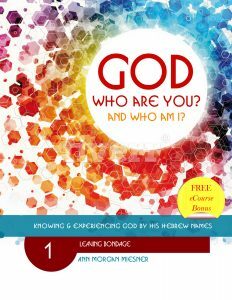 This is what the free ecourse to the book, GOD Who Are You? AND Who Am I? is all about. How can He know me? How can I know who I am? There’s only one way I know – that’s by knowing Him by His name. How can we say we know someone when we don’t even know their name? Do You Want to Know God by His name? GOD Who Are You? AND Who Am I?––Knowing and Experiencing God by His Hebrew Names is about seeking and finding a personal relationship with God as demonstrated through the stories of over 40 women and their families. When we grow to know God, we learn who we are. We learn to face where we came from, and discover who we are and where we are going. It will help equip you for this eternal journey. Jesus is coming back very soon for His mature bride! Are you ready to come face-to-face with Him? The book comes in one paperback book – a book and a workbook – four parts included––in English, Spanish and Russian–as a devotional and for small group studies. All four parts, meaning all four eBooks/workbook, are included. if you don’t have a printer handy, you can have the WORKBOOK beside you so you don’t have to download the exercises which provide additional, valuable information. Allow me to be your virtual tutor/mentor. Because it takes time to internalize the concepts of who God is, I chose this method It gives the Holy Spirit time to take the information from your mind and turn it on and light it up in your heart – your computer. Who is the FREE eCourse Bonus for? Discover in this Free eCourse Bonus? When we talk about His Hebrew names, God Most High shows up! You will receive : Because God Is . . . I Am booklet– personalized Scriptures from each of the twelve modules in the book which describe twelve of God’s character names and how they apply to you. They tell you: “I Am God’s Child, I Am Alive, God Sees Me as He Sees Jesus, B-E-A-R Facts of Faith Words, I Am Guided when I Follow, I Am Blessed, I Am Free, I Am Healed, I Am Salty, I Am a Member of the Mature Military Bride, I Am Jesus’ Feet, I Know Who I Am.” When confessed, bring miracles daily. Go HERE and sign up now. Oh . . . before you do, is there a friend, or husband, wife, you would like to travel with? Stay together, and sign up the same day. I will see you on the other side with your free booklet!